Flowers and Mother’s Day have always gone together like peanut butter and jelly. Back in the day, moms would get corsages to wear to church on the second Sunday in May to proudly proclaim their family’s appreciation and affection. And these days sending a bouquet to your mother continues to be a classic way of honoring your mom on Mother’s Day. However, while I adore flowers, my mother-in-law has allergies and sending her a bouquet of flowers would be tantamount to giving her poison ivy as a gift. Also, her birthday is May 15th which means that it ‘s hard not to end up combining the celebrations. So, how to acknowledge her special day without taking away from her birthday or causing her to have an asthma attack? Fortunately, she has a sweet tooth so, over the years, I have been able to give her an assortment of floral-themed goodies for Mother’s Day. Last year, I found this colorful little box decorated with zinnias from Michaels. 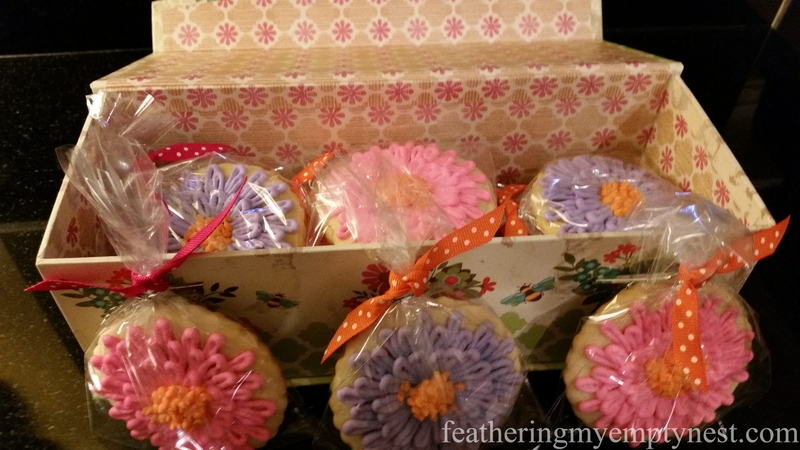 It inspired me to make her some zinnia decorated sugar cookies, and I thought that box itself would also make a lovely gift that she could display on her desk and use as storage for pens or something after she consumed the cookies. 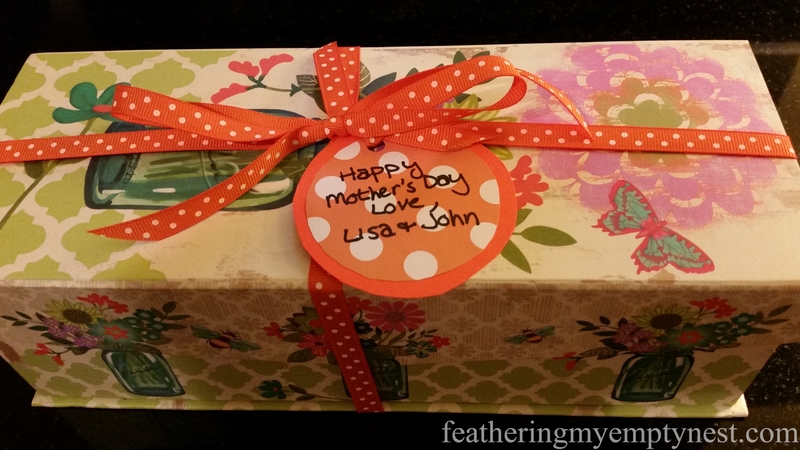 Decorative zinnia box wrapped with orange polka dot grosgrain ribbon and gift tag. I used my favorite almond flavored sugar cookie recipe (see below) and a scalloped cookie cutter to make the cookies. I decided that I would make two different color zinnias both with orange centers. I made a batch of royal icing (recipe below) that I divided and tinted pink, purple and orange with Wilton gel icing colors. 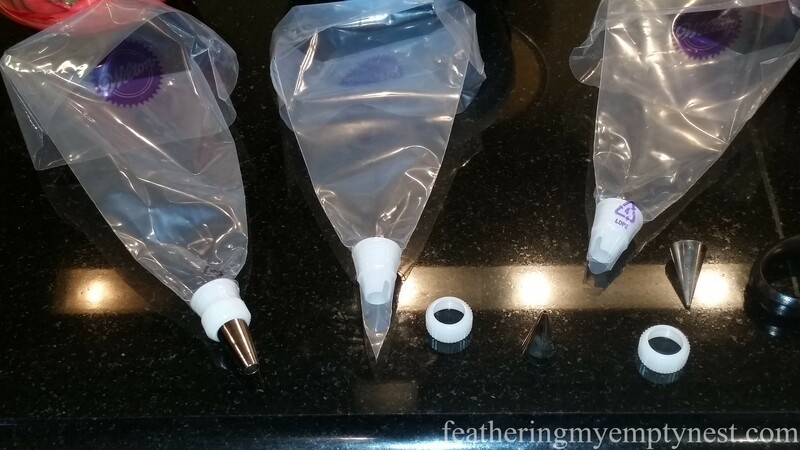 After inserting couplers into three piping bags, I filled each bag with icing. Using a #4 Wilton round tip, I piped side by side small teardrop-shaped loops around the outside edge of the cookie. I then continued making teardrops in concentric circles, slightly overlapping the bottom and in between the petals of the previous row. I left a small open space at the center of the cookie. Using the same tip, I piped a series of orange dots in the open space to make the pistils of the zinnia. After the icing dried and hardened completely, I put the cookies in clear cellophane bags and tied them at the top with orange and pink polka dot ribbon. I was able to fit a dozen cookies in the box. 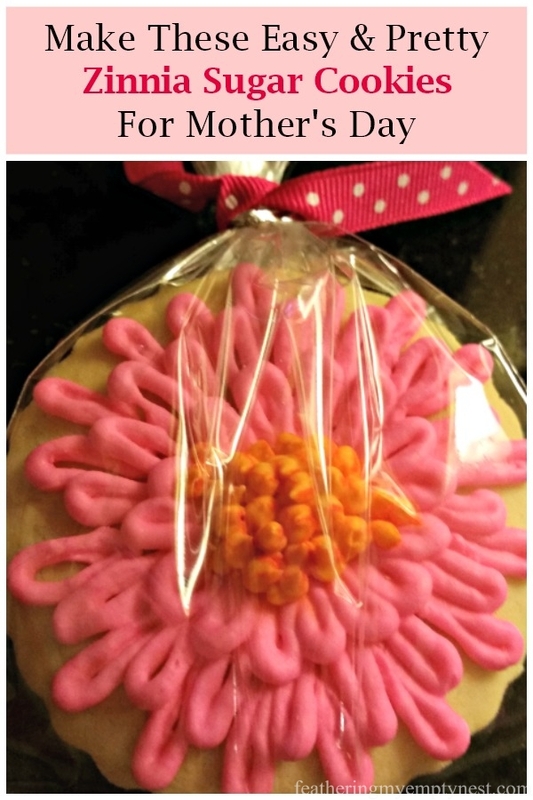 Whether you give your mom a beautiful bouquet of fresh cut blossoms, a plant, or a boxful of “blooming cookies, flowers are a great way to tell your mother how much you love her and appreciate all she does. In a large bowl combine butter with sugar, eggs, vanilla and almond extract, beat using an electric mixer on high speed until pale yellow and fluffy. In another bowl combine the flour with baking powder, baking soda, and salt, gradually stir into the butter mixture until well blended. Cover bowl with plastic wrap and chill for 2 hours. Line cookie sheets with parchment paper. Roll out the dough on a lightly floured surface to 1/4 thickness. Cut using a scalloped cookie cutter. Place cookies 2 inches apart on cookie sheet. Remove cookies to wire racks to cool completely before icing. Beat all ingredients at low speed for 1 minute and then 10 minutes on high until icing forms peaks. Congratulations on a gorgeous cookie! Just spectacular! 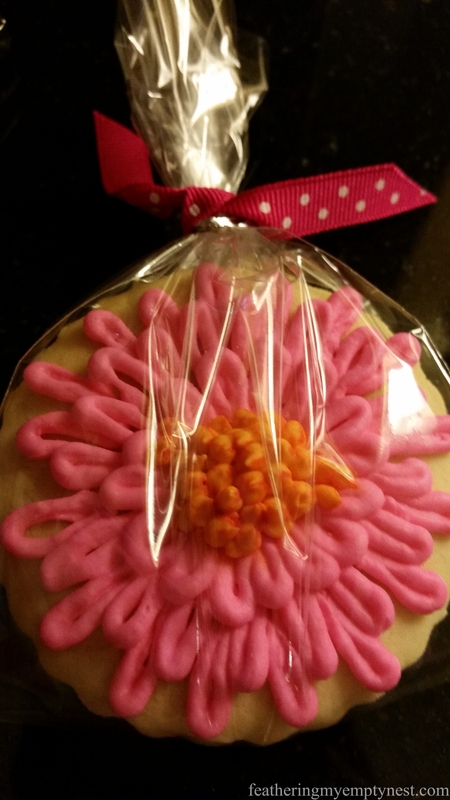 Thank you so much for taking the time to visit my blog and comment on my Zinnia Cookie post. These cookies are so pretty I would feel sorry eating them… but I think I could make an effort, I am sure they are delicious. 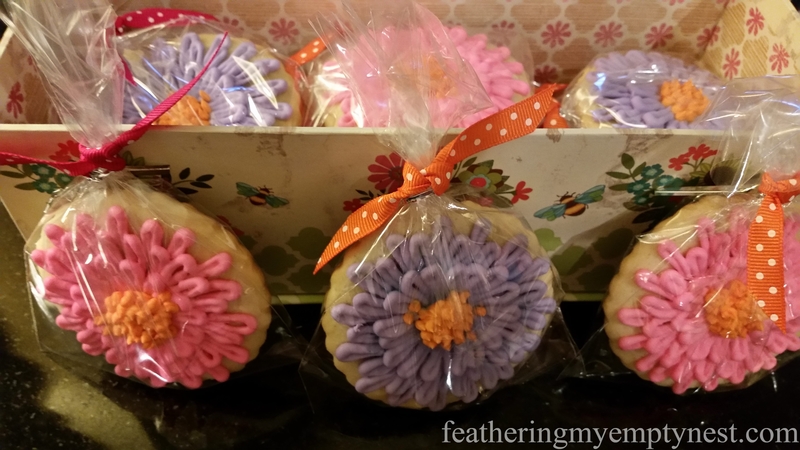 Thanks so much for your kind comment on my Zinnia Sugar Cookies. They are really tasty. Some sugar cookies don’t taste like much of anything but this dough is really flavorful. Thanks so much. Hope you have a great week too and a Happy Mother’s Day. Such a great idea. The flower are so pretty. Thank you so much for visiting my blog and taking the time to comment. It means so much to me. Such a great idea for someone who is allergic to flowers– just as pretty and I’m sure they taste better than actual zinnias haha. Thanks for your kind words and for stopping by! These are some of the prettiest cookies I’ve ever seen and no doubt…super delicious!! Thank you so much. I’ve tried a lot of sugar cookie recipes over the years and I can honestly say this is the best. These cookies are too beautiful to eat. Thanks for sharing at Over The Moon Party. 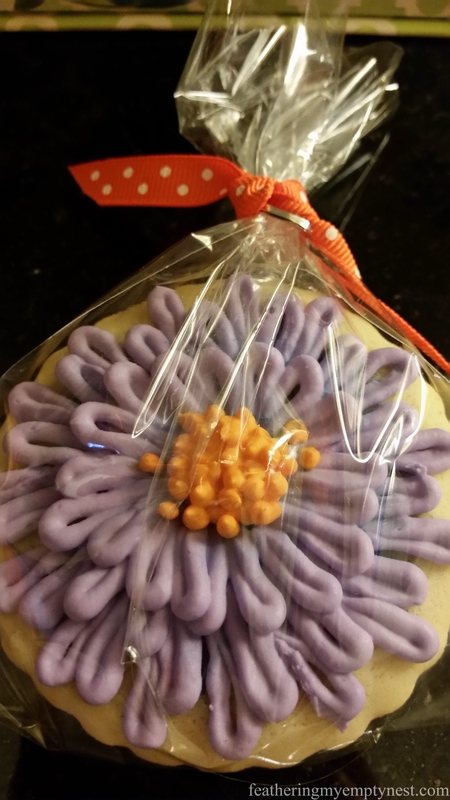 Thanks for your comment on my Zinnia cookies and thanks for hosting Over The Moon. Your cookies are magnificent! I am going to try your recipe–my cut-out cookies tend to puff which distorts the pretty shape. Thanks so much. You should definitely try them. I’ve tried tons of recipes and I really feel this is the best. © larr and featheringmyemptynest.com, 2016-2017. Unauthorized use and/or duplication of this material without express and written permission from this site’s author and/or owner is strictly prohibited. Excerpts and links may be used, provided that full and clear credit is given to larr and featheringmyemptynest.com with appropriate and specific direction to the original content.